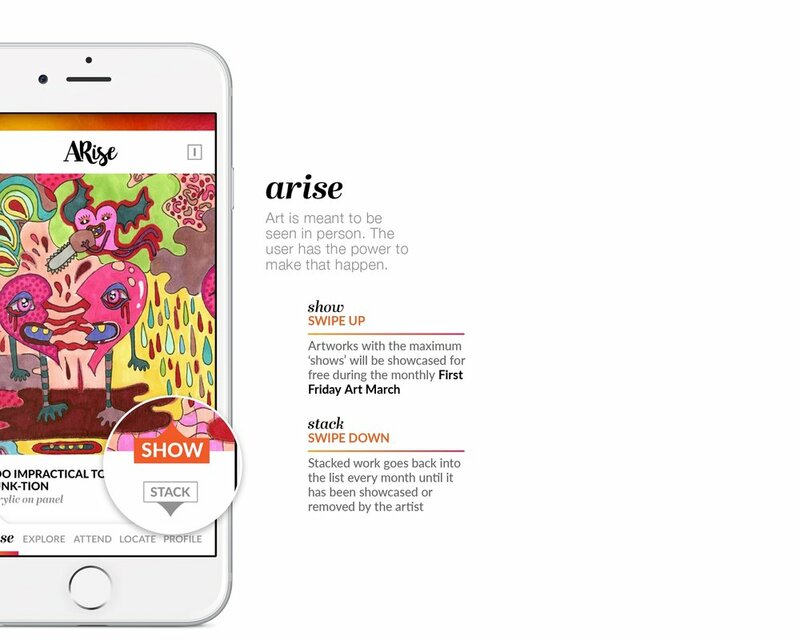 ARise is a comprehensive social app for Art Rise Savannah - an organization that is dedicated towards making the city of Savannah the Art capital of the South. Art Rise Savannah is an organization that aims to develop a sustainable creative economy in the city of Savannah. Through their initiatives such as the First Friday Art March, the Non-Fiction Gallery, and the Savannah Art informer blog, Art Rise Savannah has been successful in starting a dialogue with the people of the city. In order to facilitate that conversation there is a need for a social mobile application. The research derived from the students of the SCAD School of Design Arielle Vilardo, Eric Green, Wenchao Ma, Boqiang Su and Srujana Akkiraju were instrumental for gaining insight into the drivers and unseen motivations of both the Art Rise Savannah organization and its people. This was initially a group project that I worked on with Keeley Gribb, Shruti Shyam and Vitor da Silva. I have made some changes to the experience since then. From the insight report presented by the School of Design team, we identified the limitations and opportunities of Art Rise Savannah and its entities. 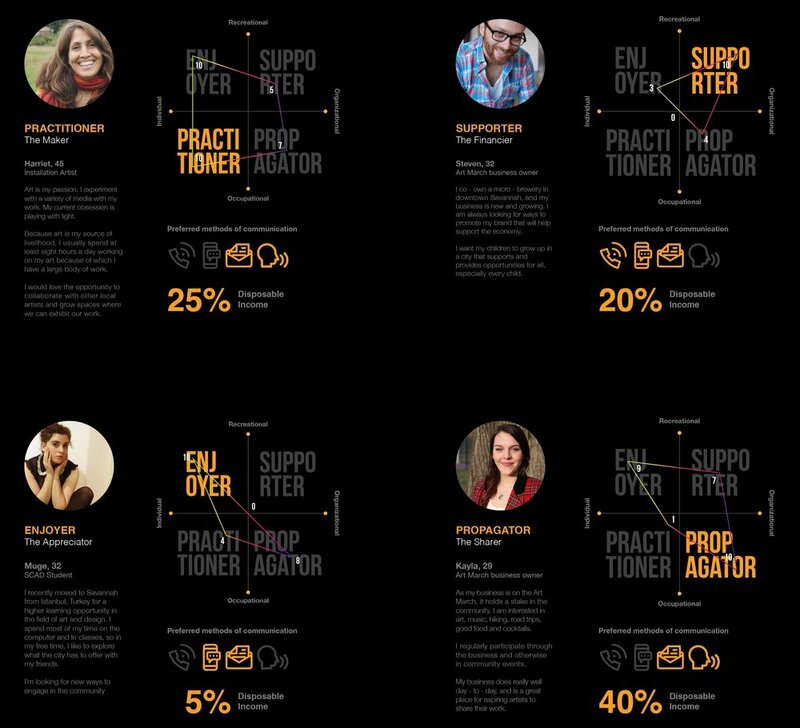 The user personas were built based on the types of users highlighted in the report. All 4 of us in our team picked a persona and stuck with it for the rest of the project. This enabled us to work well as a team and split the work in a manner that let all of us contribute equally. My focus was on the enjoyer. Because Art Rise Savannah is an amorphous collection of entities, members of its community struggle to connect with its creative economy. 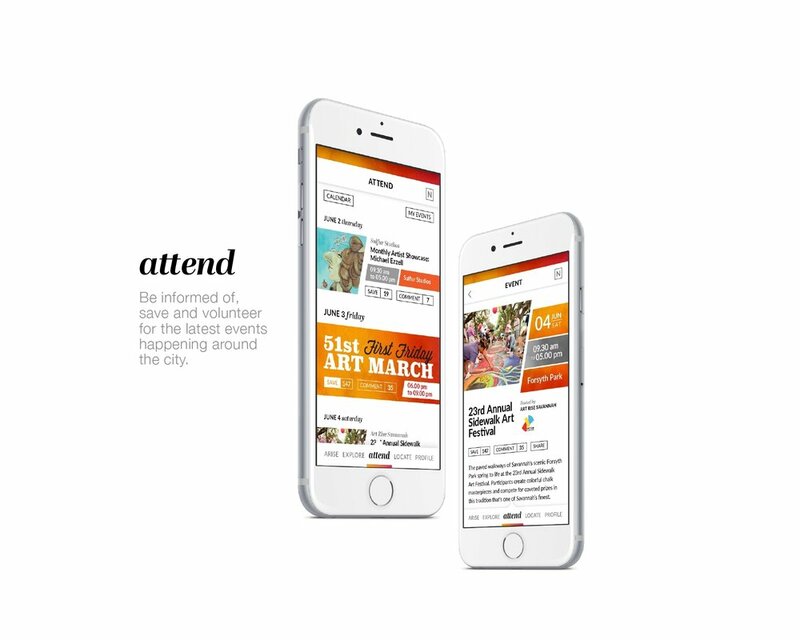 To aid members of the community in accessing the various entities of Art Rise Savannah, by creating a platform that fosters creative economy through engagement and discussion. At this stage of the process we delved deeper into our persona stories. By doing some primary research user scenarios were developed, which enabled us to chart out functional requirements, elements and flows. I have used the scenarios of the enjoyer as an example of how we broke down the context story for each category. At this stage we tested task flows on multiple users. We did a few rounds of low fidelity development and then moved on to medium fidelity prototyping. The final high res prototype was built on Invision. In exploration of the ARise identity, the group chose to explore eclectic, approachable branding that celebrates a variety of influences and encourages community. The aim was to bring individual and business interests together as well as the historic and modern vibe of the city. 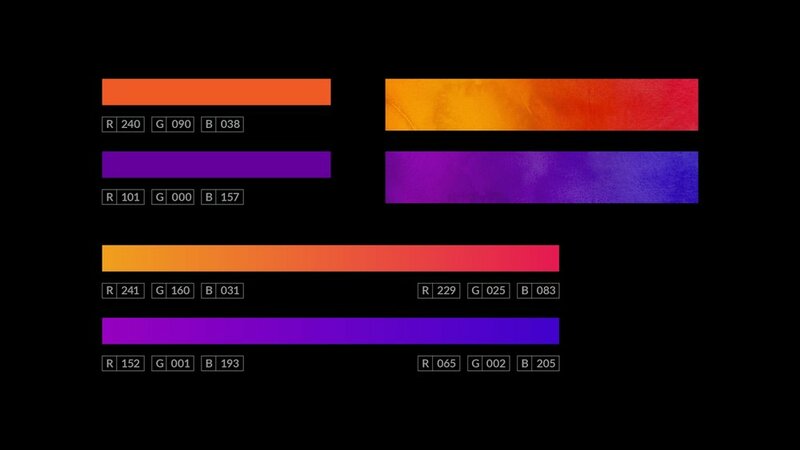 The visual language finally created managed to encompass all of this, while keeping the interface clean and all about the art. My contribution particularly at this stage of the process was immense. The two distinct primary fonts carries forward the story of two world coming together. the crispness of Lato compliments the curatorial appearance of Abril Display. Orange and purple hues were chosen as they reflect the warm savannah dusk. They also refer to a modern interpretation of an individual and business spirit. The design elements are an interesting blend between Victorian and modern aesthetics, reflecting the Savannah story.